Mangrove wetlands, one of the three coastal wetland ecosystems in the intertidal zone in tropical and subtropical regions, have important ecological and socioeconomic values. They are vital for healthy coastal ecosystems, and also provide prime nesting and migratory sites for birds and wildlife. In Hong Kong and South China, the contamination of toxic chemicals is a major threat to mangrove wetlands due to rapid urbanization and industrialization. Moderate to high concentrations of toxic contaminants have been detected in mangrove sediments. Mangrove plants also accumulate toxic contaminants, particularly in root tissues. 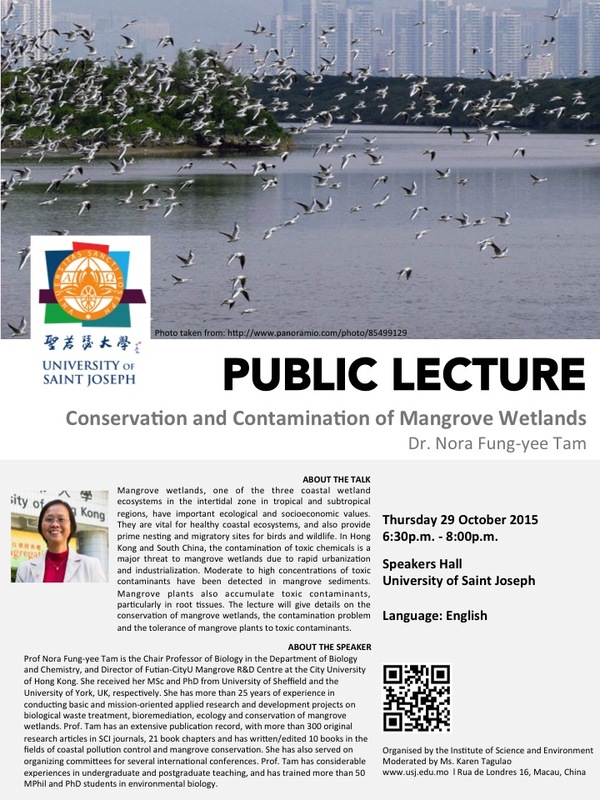 The lecture will give details on the conservation of mangrove wetlands, the contamination problem and the tolerance of mangrove plants to toxic contaminants. Prof Nora Fung-yee Tam is the Chair Professor of Biology in the Department of Biology and Chemistry, and Director of Futian-CityU Mangrove R&D Centre at the City University of Hong Kong. She received her MSc and PhD from University of Sheffield and the University of York, UK, respectively. She has more than 25 years of experience in conducting basic and mission-oriented applied research and development projects on biological waste treatment, bioremediation, ecology and conservation of mangrove wetlands. Prof. Tam has an extensive publication record, with more than 300 original research articles in SCI journals, 21 book chapters and has written/edited 10 books in the fields of coastal pollution control and mangrove conservation. She has also served on organizing committees for several international conferences. Prof. Tam has considerable experiences in undergraduate and postgraduate teaching, and has trained more than 50 MPhil and PhD students in environmental biology.